In the year 2015, there were over 263 million registered vehicles in the United States. This is up from about 193 million in 1990 and 108 million in 1970. And while it’s true that the roadway system in the U.S. has been expanded during that time, no one would deny that the nation’s roads are more crowded than ever, leading to a car accident death every 15 minutes or so. So what steps can you take to try to avoid being in a car accident, especially with more vehicles on the road than ever? With less space on the roadways, you have to maximize space whenever and wherever you can. This could mean slowing down to create more space between you and the vehicle in front of you or getting out of the way of someone who is riding your bumper. You can also create space by trying to avoid drivers you see being aggressive. It may seem obvious, but being alert and avoiding distractions is more important than ever when there is less space to maneuver. Avoiding things like looking at your phone, turning up your music too loud or focusing on a conversation with someone else in the vehicle when you should be focused on the road are all important steps you can take to make sure you are paying attention to the road and the vehicles around you. You can focus on other things when you are done the driving, but keeping your focus on the task at hand while behind the wheel can go a long way toward keeping you out of a car accident. A great way to reduce your risk of getting in a car accident on America’s crowded roadways is to simply slow down. This increases your ability to react to what is going on around you and gives you a better chance of avoiding a bad situation that develops in front of you on the road. More cars on the road inevitably mean more people using stop signs, traffic lights, yield signs, etc. Everyone else on the road expects you to adhere to those signs and directives, as you expect them to. 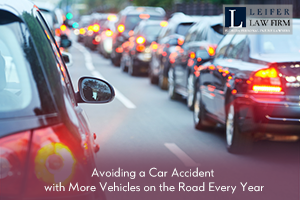 Not following what other drivers expect you to do can quickly lead to a car accident. Obviously, there are many times you have to drive somewhere. You have no choice; you have to get from point A to point B and since the technology utilized so magnificently in Star Trek is not yet available for transportation, most of us drive a car. But there are times when driving somewhere is not a necessity. In those situations, you have to ask yourself if the increased danger that goes with driving is worth the trip. If you have been in a car accident in Florida and have questions, contact the experienced attorneys at the Leifer Law Firm or call 561-660-9421 for a free consultation today.